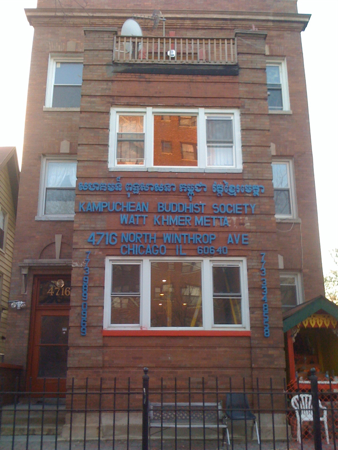 Angry Asian Buddhist: Back from Chicago! I just returned from a trip to Chicago, where I complained incessantly about the lack of 80 degree weather. Prompted by a question from Richard Harrold, one of the places I returned to was Wat Phrasriratanamahadhatu. Years ago I used to go there for chanting and meditation, and also for some of the major holidays. I also swung by Wat Khmer Metta, where some close friends of mine used to serve as monks. If any readers have visited either of these temples, I’m curious to hear your thoughts. Photos below! There is a lion in front! I should have gone this weekend. But I didn't. Perhaps next weekend. I need to make myself do this. @Richard Harrold: You might also be interested in Buddha Dharma Meditation Center in Willowbrook. Parking is easier, although the commute may be further, and their schedule is also more conducive to structured practice and discussion. Wherever you end up going, I’m curious to know what you think! 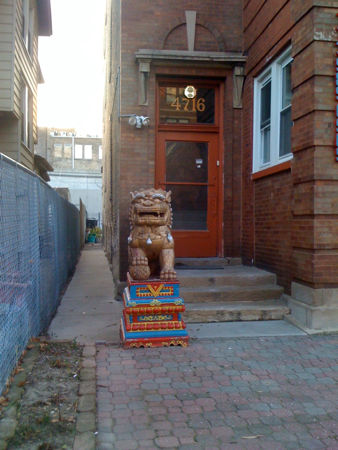 Hey Arun, Just realized that the image you have on the blog is of a meditation center at the corner of Broadway/Lawrence, but the link is to a temple on Magnolia between Wilson and Lawrence. These seem to be two different places, but are they part of the same organization? I understand them both to belong to the same entity (in addition to the house just south of the one listed on the website). 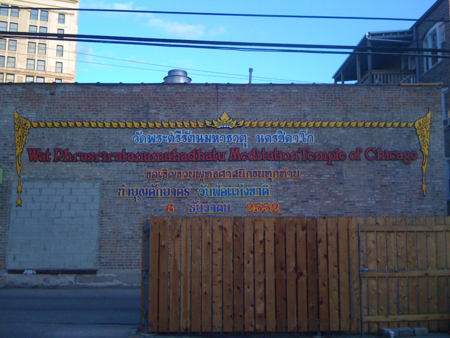 When visiting the temple on Magnolia, it’s best to enter through the alley between Broadway and Magnolia—if you find yourself looking at the wall in the image above, it will be directly behind you. For larger functions, we often went across the alley into the space on Broadway.